Each time you choose a mode, the playlist is now limited to 10. There are more than 10 videos (and next update will include some new ones) but each time you choose a mode you get a random selection of only 10. Paused running and each person using their own phone or tablet, watched a set of videos in normal mode, noting the score. Then we did our sprint session, running till fatigued. Paused again and each person using their own phone or tablet, watched a second set of videos in normal mode, noting the score. Used the score difference as an incentive - If you scored 10 on the first attempt and 8 on the second, you ran 2 more shuttles. This part is not essential but a little competition is motivating! It was quite apparent the second time around that you had to focus harder on the activity. Most people did score better - but whether that was attributed to the greater effort or familiarity of the videos is hard to say. It was from this experience that we thought it would be good to limit the exercise to 10 videos, but work towards increasing the number of videos that the 10 can be selected from. As you watch the videos you may be tempted to debate the individual result, but that's not the point of the exercise. The absolute score that you get isn't meaningful on its own. Remember the videos are shown as a random collection. Also remember that you don't have game context to help with your decision. This is a gut response. The training exercise here is to practice make decisions - and i believe the more under fatigue you are, the better! NB: Scrum is a little hard to search for in the stores. 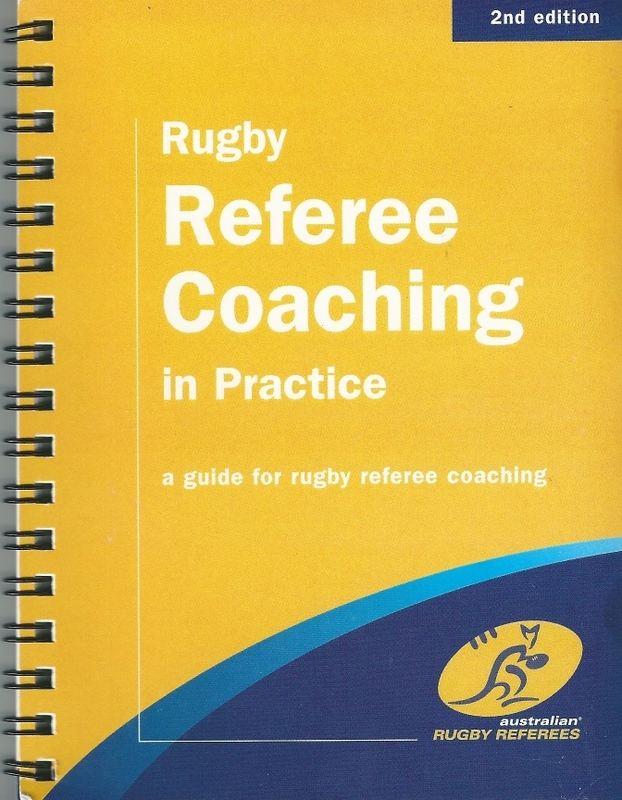 If you search, I recommend you search for RCIP (on iOS) or Referee Coach in Practice (on Android) and then scroll down and see other apps from the same publisher. Match Official Brain Training is blossoming in 2017, stay tuned and subscribe now for apps and resources to improve your refereeing. 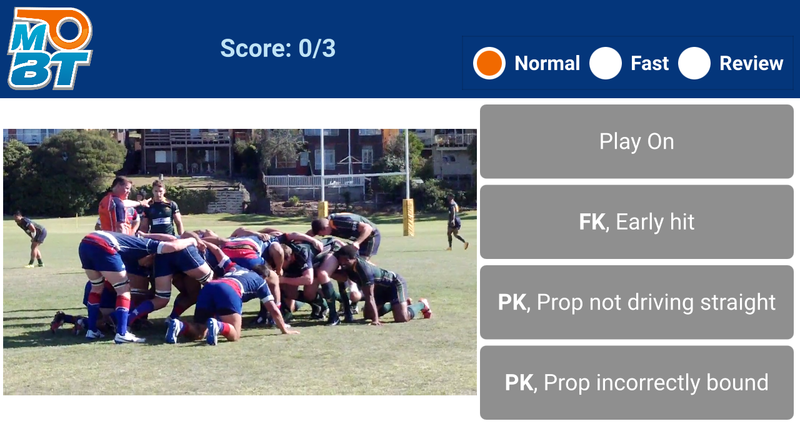 This app is a learning tool for rugby union referees to practice observing scrum scenarios making the correct decision. 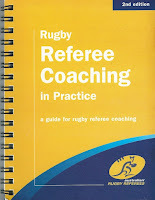 After watching each short video clip, choose the response that the referee should give from the four choices on the right. The next video will automatically start. normal speed with scoring - this is perceptual training - use this to develop your perceptual skills from repeated watching, processing and responding. 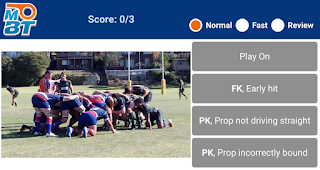 review mode (no scoring) - learning mode - if you find your scoring low, use this mode to see an annotated screenshot with the answer explained after you make a choice. Use the app either at physical rest or during a physical training activity. This great in a sprint session: between sprints, pause and watch all the videos, then sprint again. This simulates your game experience - during a match you need to make decision whilst running around - now you can do that at training too! Companion apps will be coming soon for other elements of the game.